Mobility technology leader Bombardier Transportation will present its innovative rail products and services at Exporail, the 18th Congress of the Mexican Association of Railroads. The event will take place in Mexico City, Mexico on March 26 and 27. The innovative battery-powered train operates emission-free, thereby making a significant contribution towards environmentally-friendly mobility. The train can be used to bridge non-electrified lines and replace diesel trains with clean battery-powered vehicles. Bombardier is the leading supplier of passenger rail transportation equipment in the Mexican market, with almost 70 per cent of the rolling stock and transportation systems in operation in the country today. Established in Mexico since 1992, Bombardier has developed a strong local manufacturing footprint, investing over $200 million in equipment, facility upgrades and training. The Bombardier site in Ciudad Sahagún, Hidalgo has unique capabilities ranging from the design and manufacture of rail vehicles to the operation and maintenance of passenger trains. In addition to serving the Mexican market, the site also manufactures components and trains for customers across North America and around the world. For over 25 years, Bombardier has invested in technological development, created jobs and innovation, and promoted national development, as well as local content in Mexico. We currently have 1,800 local employees and another 26,480 people depend on our activities in Mexico. Bombardier Transportation is a global mobility solution provider leading the way with the rail industry’s broadest portfolio. It covers the full spectrum of solutions, ranging from trains to sub-systems and signalling to complete turnkey transport systems, e-mobility technology and data-driven maintenance services. 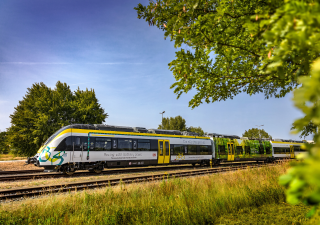 Combining technology and performance with empathy, Bombardier Transportation continuously breaks new ground in sustainable mobility by providing integrated solutions that create substantial benefits for operators, passengers and the environment. Headquartered in Berlin, Germany, Bombardier Transportation employs around 40,650 people and its products and services operate in over 60 countries. Headquartered in Montreal, Canada, Bombardier has production and engineering sites in 28 countries across the segments of Transportation, Business Aircraft, Commercial Aircraft and Aerostructures and Engineering Services. Bombardier shares are traded on the Toronto Stock Exchange (BBD). In the fiscal year ended December 31, 2018, Bombardier posted revenues of $16.2 billion US. The company is recognized on the 2019 Global 100 Most Sustainable Corporations in the World Index. News and information are available at bombardier.com or follow us on Twitter @Bombardier. Bombardier is a trademark of Bombardier Inc. or its subsidiaries.